Be sure to enjoy recreational amenities, including an indoor pool, a spa tub, and a seasonal outdoor pool. With a stay at Motel 6 St George in St. George, you'll be on the Strip, within a 10-minute drive of St. George Utah Temple and Outlets at Zion. This motel is 16.9 mi (27.3 km) from Sand Hollow State Park and 0.7 mi (1.1 km) from Dixie State University. This motel has 1 floor in 1 building and offers designated smoking areas. Recreational activities include golf lessons nearby, rock climbing nearby, and hiking/biking trails nearby. Make yourself at home in one of the 54 air-conditioned rooms featuring refrigerators and microwaves. 40-inch LED televisions with satellite programming provide entertainment, while complimentary wireless Internet access keeps you connected. Bathrooms feature bathtubs, complimentary toiletries, and hair dryers. Conveniences include coffee/tea makers, as well as phones with free local calls. When you stay at Americas Best Value Inn-St. George in St. George, you'll be in the historical district, within a 5-minute drive of St. George Utah Temple and St. George Tabernacle. This hotel is 1.1 mi (1.8 km) from Dixie Convention Center and 1.7 mi (2.7 km) from St. George Musical Theater. Make yourself at home in one of the 49 air-conditioned rooms featuring refrigerators and microwaves. Complimentary wireless Internet access keeps you connected, and satellite programming is available for your entertainment. Private bathrooms with shower/tub combinations feature deep soaking bathtubs and complimentary toiletries. Conveniences include coffee/tea makers and irons/ironing boards, as well as phones with free local calls. 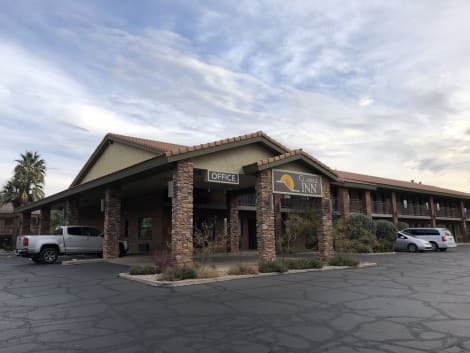 Located in St. George, Americas Best Inns-St. George is in a rural location, within a 5-minute drive of Outlets at Zion and Red Cliffs Mall. This hotel is 2 mi (3.3 km) from St. George Utah Temple and 16.7 mi (26.9 km) from Sand Hollow State Park. lastminute.com has a fantastic range of hotels in Saint George, with everything from cheap hotels to luxurious five star accommodation available. We like to live up to our last minute name so remember you can book any one of our excellent Saint George hotels up until midnight and stay the same night.